I’ll open with a caveat: we still have a long way to go in tackling the problem of income inequality in this country. But having said that, it’s also important to acknowledge that progress is being made…despite Republican gridlock in Congress. Steve Benen uses the announcement by Chipotle that they will give all of their employees (including part-timers) paid vacation time, paid sick leave and tuition reimbursement as a moment to note the growing trend – especially in food service and retail industries – to raise wages and increase benefits for their employees. Benen credits this news to the possibility that businesses are beginning to feel the effects of a tightening labor market and are anxious to ensure that they attract and keep the best available employees. I expect there is some truth in that. But it’s also important to note that people like Labor Secretary Thomas Perez have been spending the majority of their time lately working with local/state governments and businesses to adopt these changes. As I reported recently, this is the “phone” part of the pen and phone strategy President Obama announced in January 2014. Sometime soon (perhaps this week), the President will once again employ the “pen” part of that strategy to bring more good news to American workers. Debates about how to provide lower-income Americans with greater economic security often center around increasing wages. But millions of workers may be on the brink of receiving a significant boost in their income thanks to a change in a policy that is rarely mentioned: overtime pay. According to Politico, as early as this week the Department of Labor could propose a rule that would dramatically increase the percentage of the workforce eligible for overtime, a regulation that has been updated only once in the past 40 years. Currently, if you make more than $23,660 a year, your employer is under no obligation to pay you the standardized overtime rate of 1.5 times regular pay for working more than 40 hours a week. But now the Labor Department is contemplating more than doubling that threshold to $52,000, according to Politico’s report. That increase would have an enormous impact on the economy, raising pay for millions of overworked Americans and causing businesses nationwide to re-evaluate how many hours they expect their employees to work. Here’s an example to demonstrate why this is important. …an assistant manager at a fast-food restaurant with a salary of $24,000 and who spends 95 percent of his (or her) time cooking fries, running a cash register, and sweeping floors can be required to work 60 or 70 hours a week and yet be denied any overtime pay, simply because he’s classified as a manager. On the weeks he works more than 64 hours, his effective hourly wage is below the federal minimum wage of $7.25; workers who are exempt from overtime regulations are also exempt from minimum-wage regulations. The best part of all this is that it will require NO action from Congress. The law gives the Department of Labor the authority and the responsibility to periodically redefine the salary level that qualifies for overtime. But this threshold of $23,660 has only been raised once since 1975. That’s why such a drastic increase is needed. The other good news here is that if employers want to avoid paying time and a half for overtime, they can simply hire more people – thus creating jobs. What they won’t be able to do is pay someone $24,000 a year, call them a “manager” and expect them to work 60-70 hours a week. So one of the things that I’m going to be talking to my Cabinet about is how do we use all the tools available to us, not just legislation, in order to advance a mission that I think unifies all Americans — the belief that everybody has got to take responsibility, everybody has got to work hard, but if you do, that you can support a family and meet the kinds of obligations that you have to yourself and your family but also to your communities and to your nation. 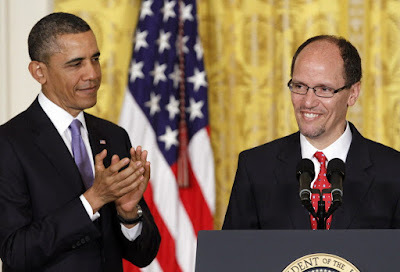 On March 13, 2014 President Obama issued a memorandum to the Secretary of Labor directing him to “propose revisions to modernize and streamline the existing overtime regulations.” The comment period giving the public time to weigh in on this issue has expired and the Secretary is about to issue new rules shortly. What we see then, is that the same man who reignited the work of the Civil Rights Division at DOJ after it had been decimated and politicized under the Bush administration is the one who is now being very effective in fighting to improve things for American workers. I think it’s high time we acknowledged the profoundly important work of Secretary Thomas Perez.